Continuing the documentation on the fastai_v1 development here is a brief piece about mixed precision training. A very nice and clear introduction to it is this video from NVIDIA. In neural nets, all the computations are usually done in single precision, which means all the floats in all the arrays that represent inputs, activations, weights… are 32-bit floats (FP32 in the rest of this post). An idea to reduce memory usage (and avoid those annoying cuda errors) has been to try and do the same thing in half-precision, which means using 16-bits floats (or FP16 in the rest of this post). By definition, they take half the space in RAM, and in theory could allow you to double the size of your model and double your batch size. Another very nice feature is that NVIDIA developed its latest GPUs (the Volta generation) to take fully advantage of half-precision tensors. Basically, if you give half-precision tensors to those, they’ll stack them so that each core can do more operations at the same time, and theoretically gives an 8x speed-up (sadly, just in theory). So training at half precision is better for your memory usage, way faster if you have a Volta GPU (still a tiny bit faster if you don’t since the computations are easiest). How do we do it? Super easily in pytorch, we just have to put .half() everywhere: on the inputs of our model and all the parameters. Problem is that you usually won’t see the same accuracy in the end (so it happens sometimes) because half-precision is… well… not as precise ;). 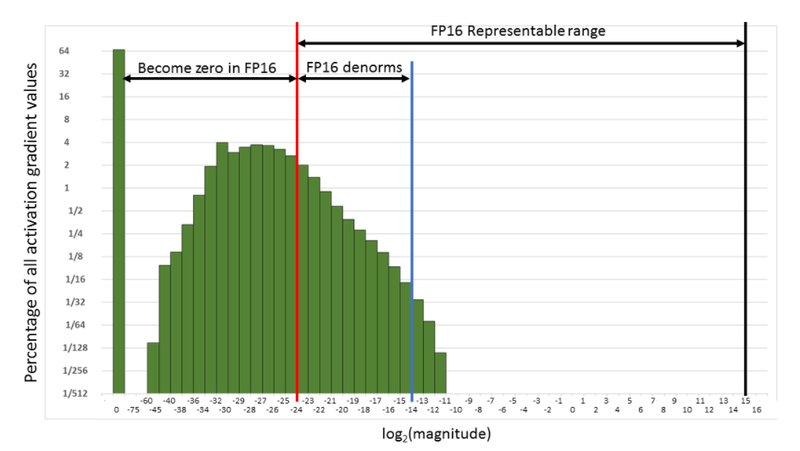 To understand the problems with half precision, let’s look briefly at what an FP16 looks like (more information here). The sign bit gives us +1 or -1, then we have 5 bits to code an exponent between -14 and 15, while the fraction part has the remaining 10 bits. Compared to FP32, we have a smaller range of possible values (2e-14 to 2e15 roughly, compared to 2e-126 to 2e127 for FP32) but also a smaller offset. For instance, between 1 and 2, the FP16 format only represents the number 1, 1+2e-10, 1+2*2e-10… which means that 1 + 0.0001 = 1 in half precision. That’s what will cause a certain numbers of problems, specifically three that can occur and mess up your training. The weight update is imprecise: inside your optimizer, you basically do w = w - lr * w.grad for each weight of your network. The problem in performing this operation in half precision is that very often, w.grad is several orders of magnitude below w, and the learning rate is also small. The situation where w=1 and lr*w.grad is 0.0001 (or lower) is therefore very common, but the update doesn’t do anything in those cases. Your gradients can underflow. In FP16, your gradients can easily be replaced by 0 because they are too low. Your activations or loss can overflow. The opposite problem from the gradients: it’s easier to hit nan (or infinity) in FP16 precision, and your training might more easily diverge. To address those three problems, we don’t fully train in FP16 precision. As the name mixed training implies, some of the operations will be done in FP16, others in FP32. This is mainly to take care of the first problem listed aboved. For the next two there are additional tricks. The main idea is that we want to do the forward pass and the gradient computation in half precision (to go fast) but the update in single precision (to be more precise). It’s okay if w and grad are both half floats, but when we do the operation w = w - lr * grad, we need to compute it in FP32. That way our 1 + 0.0001 is going to be 1.0001.
back-propagate the gradients in half-precision. copy the master model in the FP16 model. Note that we lose precision during step 5, and that the 1.0001 in one of the weights will go back to 1. But if the next update corresponds to add 0.0001 again, since the optimizer step is done on the master model, the 1.0001 will become 1.0002 and if we eventually go like this up to 1.0005, the FP16 model will be able to tell the difference. That takes care of problem 1. For the second problem, we use something called gradient scaling: to avoid the gradients getting zeroed by the FP16 precision, we multiply the loss by a scale factor (scale=512 is a good value in our experiments). That way we can push the gradients to the right in the next figure, and have them not become zero. compute the output with the FP16 model, then the loss. multiply the loss by scale then back-propagate the gradients in half-precision. copy the gradients in FP32 precision then divide them by scale. do the update on the master model (in FP32 precision). For the last problem, the tricks offered by NVIDIA are to leave the batchnorm layers in single precision (they don’t have many weights so it’s not a big memory challenge) and compute the loss in single precision (which means converting the last output of the model in single precision before passing it to the loss). For now, this gets a full training of CIFAR10 to 94% with AdamW and 1cycle in 7min20s in a notebook (baseline is 6min45s, the fastai DawnBench entry). There are a few other tricks to add to get there but compared to 13-14min in single precision, it’s still a huge improvement! This is awesome and I must say one of the main reasons to jump into fastai. I am using learn = learn.to_fp16() in a 1080 Ti. Based on this https://www.pcper.com/reviews/Graphics-Cards/What-GP102-Could-Mean-NVIDIA I understand that FP16 performance on GP102 (1080 Ti, etc.) would be extremely poor (1:32 or 1:64 FP32) but I am not seeing that. Speed Im getting is the same as in fp32 and I am able to fit 2x batch size in memory. Has anybody explored 1080 Ti FP16 performance in fastai? Thanks for the awesome explanation. What does your overall memory consumption look like when using mixed precision vs single precision? Are you able to increase your batch sizes in practice or does keeping a single precision copy of your weights cancel out the single precision gains w/ respect to overall memory usage. I’m sure it varies based on which model you use, but any insights on what you’ve actually seen in practice would been interesting to know. GTX 2080/2080Ti RTX for Deep Learning? I didn’t try any of this. Didn’t have a lot of time to experiment with mixed precision with the development of the library. If anyone has useful finds to share, I’d be interested too! so, I was thinking of trying out the FP16 support in fastai today, but didn’t quite manage. I’m running on a V100 on GCP, and from what I see it does have support for FP16. However, the kernel just dies when calling the fit variants on the learner object after converting it to fp16. Not only that, but the notebook cannot initalise the kernel on reloading. I’m forced to restart the whole jupyter process to resume work again. Is this something you’ve run into before ? There isn’t much in jupyter logs either. How can I go about getting some more debug info on this ? I’ve never seen that - but not sure anyone has tried on GCP before. I wonder if it’s a CUDA version issue. Show us output of fastai.show_install(0) please. I tried running the notebook again, and I run into the same issue. The show_install(0) output and jupyter logs below. Now, I can see that the notebook cannot reconnect back to the kernel after crashing, because of (zeromq)resources not being released properly. But, I don’t think much can be done about that, as it’s deeper in jupyter codebase. But, I still don’t see anything relevant to CUDA/cuDNN causing the crash. How do I do predictions with a learner after doing to_fp16? 181         "Return predictions and targets on the valid or test set, depending on `is_test`." 35     "Predict the output of the elements in the dataloader." I experience this. As a workaround, I’ve been recreating the learner without mixed precision then reloading the weights which allows get_preds to work. a bug though it looks like. How do you do that, I am unable to do so. The problem appers to come from the validate() function. Its kind of logical, I am loading fp16 weights, and trying to eval in fp32 validation. Hmm, OK interesting. I had (possibly mistakenly) assumed master weights themselves would be kept fp32 while resource eating calcs would be in fp16. (EDIT: post 1 seems to say as such). It works for me just fine in my use case, but will keep an eye on this thread while I try to understand mixed precision a little more. >>/opt/conda/lib/python3.7/site-packages/torch/nn/functional.py:1126: UserWarning: nn.functional.sigmoid is deprecated. Use torch.sigmoid instead. You’re using CUDA 9.2, I think that’s the issue. I’ve been doing mixed-precision tests on GCP V100s as well as PaperSpace V100s, both without a hitch. … if you follow the instructions carefully (most important is to download CUDNN locally before running) it will provision your clean Ubuntu 18.04 GCE or PaperSpace node with CUDA 10, PyTorch 1.0 dev (a Python 3.7 build . I made), fastai and a starter conda environment within which mixed-precision training with fastai works like a charm. This does look interesting. You’re talking about the 410 drivers for CUDA 10, right ? I’m hoping there’ll be an official pytorch build with CUDA 10 support soon. This looks like your own custom build ? I remove pytorch completely and installed it again. Then everything worked fine. Even though I could be able to increase the batch size, it didn’t give me any speed improvement. Tangent question - has anyone tried MPT on the newer RTX cards? While they don’t have the full capacity of a Volta, supposedly they do not have FP16 crippled like the 10-series cards do, so I’m curious to see the results. It is indeed using my custom build of PyTorch, currently of the November 24 PyTorch master.